I’m pretty sure in this new age of over-diagnosed psychosis, I’d be labeled as having ADHD. I used to think I could multi-task, but I now understand I’m just a scatter-brain that has trouble focusing on any one thing for more than a minute. After understanding I’m much better at single-tasking to get things done, I began my search for tools to help me focus. I’m a big fan of the Pomodoro technique for productivity: essentially a 25 minute focused work time followed by a 5 minute break. To truly follow the technique you need to throw a longer break session in after a couple of work sessions, but I like the general idea of work + break + work + break. The relatively short work periods makes me rush to finish up what I’m doing. And the alarm that hits after the allotted work period is a good reminder for me to get away from my screen and move my body to refresh my mind. 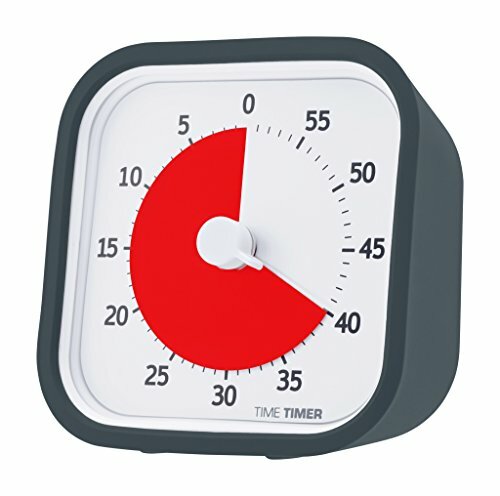 I’ve tried various Pomorodo timer apps both on my phone and computer, but never fell in love with any of them. Then I found the Time Timer while researching ways to help my kids better manage their time and have been loving it for work and play. The Time Timer is so simple it almost seems silly. It only has one knob which you can turn to any minute increment up to an hour. As it counts down, a red disk slowly disappears, visually showing you how much time is left. So what makes the Time Timer so useful? Initially I think it was made as a teacher’s aid to help children who don’t know how to read a clock yet, to grasp the concept of time given to a task. You don’t need to know how to tell time to see the red disk slowly disappear and understand when it’s gone, that your time is up. I was also intrigued to hear Google was using the Time Timer as a tool in their ultra-productive accelerated product team. This is what got me over the edge on shelling out the (relatively) steep price of the Time Timer. For those like me who don’t always intuitively know what “5 minutes” is, it’s wonderful to be able to glance at the Time Timer and know instantly how much time I have left on a task. I’ve also been using it to prevent tardiness as a family. I don’t think we’re the only family who’s a bit slow to get out of the house. These days, I set the Time Timer to go off 5 minutes before we need to be in the car and place it on the dining room table where we can all see it. I wouldn’t have imagined a little thing like this would help us become a family on-time! I purchased digital timers for each of our kids years ago, and always tell them to set the timer to 20 minutes whenever they game. Problem was, my kids are smart (and I bet yours are too). I’d find my kids still playing their devices after the allotted time and ask what happened. They’d say they paused it to go to the bathroom, or wait for a game to load etc … often conveniently “forgetting” to re-start the timer. Switching to the simple Time Timer has fixed this. The added rule in our house for screen time is that once the Time Timer is set, it cannot be changed by anyone – no bathroom breaks or other ill-defined interruptions will allow the stoppage of time. This has been great! Everyone can agree and visually see the time ticking away. 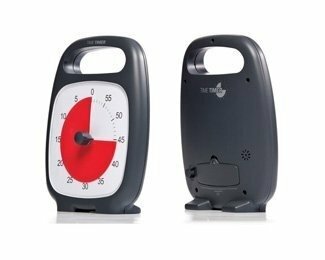 Much faster and simpler to set than digital timers (of which I own many), I’ve found the Time Timer a great kitchen companion. From steeping tea to heating up my BBQ coals, the Time Timer has replaced my digital timer for much of my simpler cooking needs. Just note it’s not the most accurate, so if you need an exact time, use a digital timer. 4-beep alarm is just shy of annoying – it can’t be ignored and isn’t grating enough to make you want to throw it across the room. Price. Expensive for such a simple device. But more than worth it for what it has done for us. The Time Timer has become one of my favourite household items for helping keep my kids and me in-check. 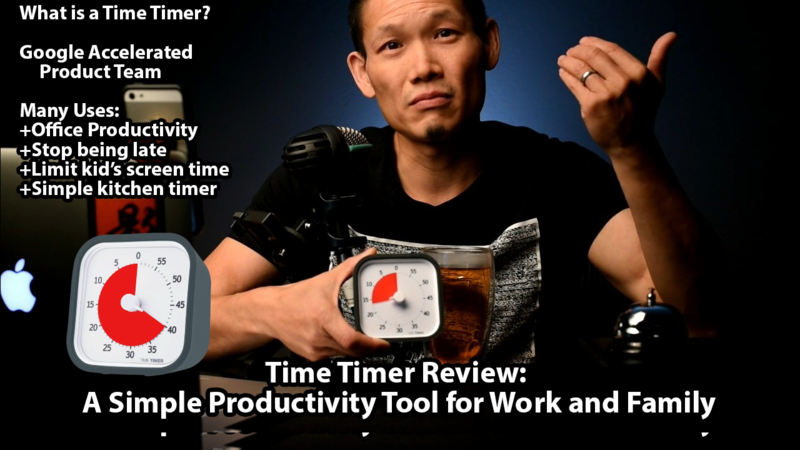 How do you plan to use the Time Timer? I’d love to hear your favourite tools, tips and tricks for staying focused and making the most of your time.